SavannaBel is Food & Home Entertaining’s Blogger of the Month! I’m delighted to announce that leading South African food magazine, Food & Home Entertaining, has selected me as their Blogger of the Month for the November issue, which hits the shelves today. Those will be shelves in South Africa, not the Zambezi Valley … yet. A blogpost on the article will follow soon! Huge gratitude for this recognition, and huge gratitude to all my followers for your interest and support! Food & Home Entertainment magazine, November 2015 issue. Well Done Annabel! A well deserved accolade for great photographs and mouth watering recipes. Who said the Zambezi Valley dulls the brain! Well done! Well done!! Well done!!!! Thank you, Di. I really do appreciate your interest and support in SavannaBel. It makes it all worth it! Fantastic and well deserved. Can the magazine be viewed online? Thank you, Jan! 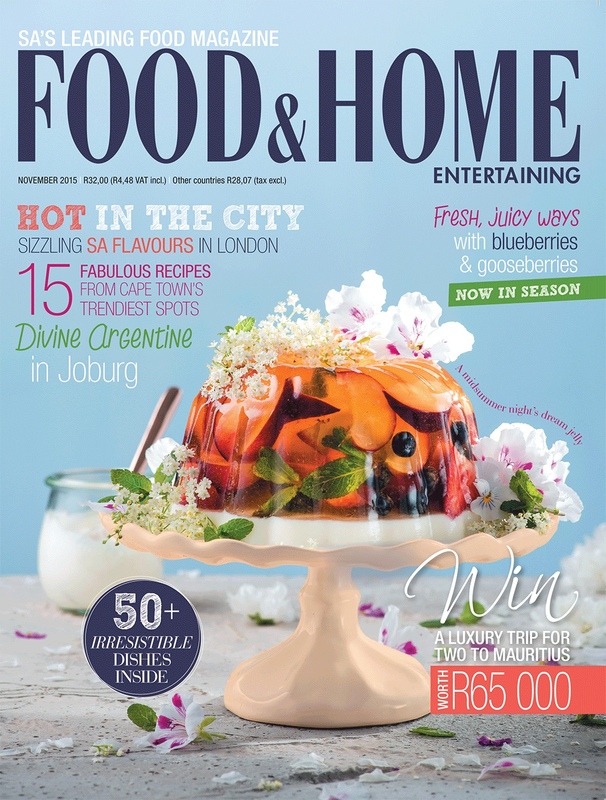 The magazine can be viewed on-line at http://www.foodandhome.co.za, although I am not sure if you will be able to see my article. I will, however, be posting it here in the weeks to come. How wonderful, congratulations Annabel! So happy for you. Look forward to seeing the magazine. Thank you very much for your kind comment, vlermeisie. You’ll no doubt see the profile before me … and I hope you enjoy it! Congratulations Annabel. No surprise you are voted the best. I’m going to rush out and get the November issue of Food & Home. A great magazine. Great stuff may it lead to even bigger and more magazine articles. Well done. I have only been following your blog a short while since you sold your home in the states. You wrote an amazing piece on the history off your home. The beautiful photos of where you live now are very inspiring. So happy we can read your blog online here in Sydney Australia. Thank you, Michelle … as always. Congratulations. I picked up my copy of F&H yesterday and am delighted to find (and now follow) your blog. Loved your one on Zanzibar, am hoping to get the opportunity to visit it next year.